A first step towards tackling autoimmune diseases such as multiple sclerosis (MS) with bone marrow transplants has been taken by scientists. The technique involves a more efficient transplant that removes the need for potentially damaging radiotherapy or chemical treatments. So far it has only been tested on mice, but researchers believe there could be "potentially big" benefits for human patients. 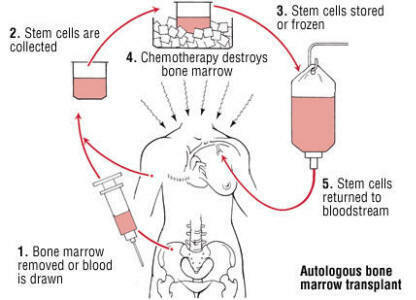 Bone marrow transplants, which transfer adult stem cells to the patient, are now mostly reserved for patients with life-threatening blood cancers such as lymphoma and leukaemia. Once transplanted, these cells transform into blood and immune system cells. 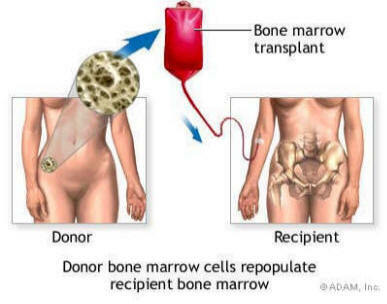 But before a transplant can be performed the patient's original stock of stem cells must first be cleared out. This is currently done using intense radiotherapy or chemotherapy treatment, which can seriously damage body tissues. Patients may be left infertile, brain damaged, or at increased risk of further cancer. For this reason the treatment is considered unsuitable for autoimmune disorders, although some research has been done on marrow transplants for MS sufferers. In theory, renewing the immune system could prevent the body attacking itself and cure an autoimmune disease. The new approach uses an antibody to wipe out the original stem cells without the harmful side effects of radio or chemotherapy. The molecules destroy blood and immune system stem cells by latching onto specific proteins on their surfaces. Once removed, the new stem cells can be transplanted. Professor Irving Weismann, from Stanford University School of Medicine in California, who co-authored a paper on the research in the journal Science, said: "It is essentially a surgical strike against the blood-forming stem cells." Healing Mercury in makeup Subcutaneous IVIg PAGE.